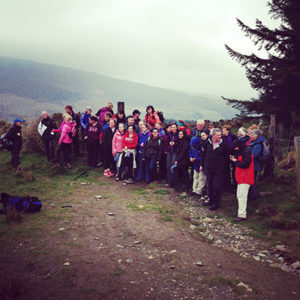 Our monthly Camino preparation walk took place this Sunday so we’d like to thank all of you who came along. 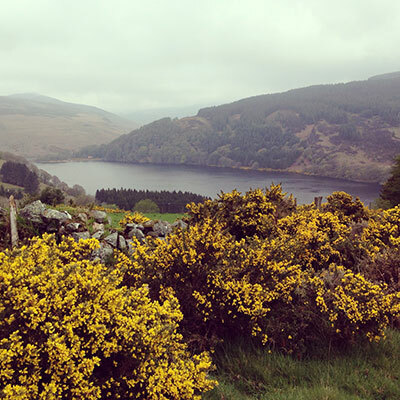 This time we headed for County Wicklow, just outside the village of Roundwood, for a short 4km trail with great views over Lough Dan. The weather didn’t look too promising to start with but the rain held off and by the end of the trek the sun was shyly starting to shine. The CaminoWays.com preparation walk is getting more and more popular, and it is fantastic to see some familiar faces coming along each month. It is a great opportunity to socialise, ask any questions about upcoming Camino de Santiago, Via Francigena or any other walking holidays you might be embarking on, and of course, nothing beats a bit of fresh air and exercise in the outdoors on a Sunday morning! Our Camino preparation walk is free and it is open to everybody, even if you are not training for the Camino de Santiago any time soon so all walkers are welcome. Each month we try to find a different route in the Dublin/Wicklow area so it is accessible to most of the CaminoWays.com staff. Although last year part of the team headed to Mayo and Croagh Patrick for Reek Sunday. We are always open to new ideas and routes. While short, the Lough Dan walk was a good taster for what’s to come up later in the year, as we are planning a very special Sunday Walk in July to combine our monthly walk with Saint James Day celebrations (25th July) in the Lough Dan area. So keep your eyes peeled and save the date! If you would like to receive notifications by email about our upcoming events and Camino preparation walk, send us an email to mkt@caminoways.com to register for our newsletter and email alerts. Hi Mary, all our events are listed on our Facebook page: https://www.facebook.com/caminoways/events. This month is a bit different because we are hosting the CaminoWays.com Walking Festival on Sunday 27th July (ticketed) but in general we host our free monthly walk the last Sunday of each month, generally around the Dublin/Wicklow area. I hope this helps! Hi, would like to receive info on your monthly walks please.